The World Cup started this week in Brazil. You don’t care? Alas, no one is perfect. In our house, we are eating and sleeping World Cup. The official start was Thursday, June 12th. We were ready. Custom calendar of games. Color coded U.S.A. games, TV station identifications and U.S.A. Clip Art. As a fail safe, I also downloaded it to my iCalendar. Just in cases people. The 12th of June also happens to be my husband’s birthday. In true fashion, I almost double booked. ALMOST. Every year. Never fails. Thank goodness I actually made reservations and bought gifts this year. Worst. Birthday. Celebrator. Ever. But a month-long of soccer greatness covers a multitude of sins. I think. Of course, Day 1 will have its fill of drama. A questionable call may have cost Croatia an advantage. It’s not futbol without drama people. For the Opening Ceremony, J.Lo and Claudia Leitte looked fab in sequins, and Pitbull couldn’t decide which size to get so he went with a schmedium. To round out Day 1 drama, the Croatian team went skinny dipping after the game. We all deal with loss in our own way. No, I’m not going to post any naked pics. 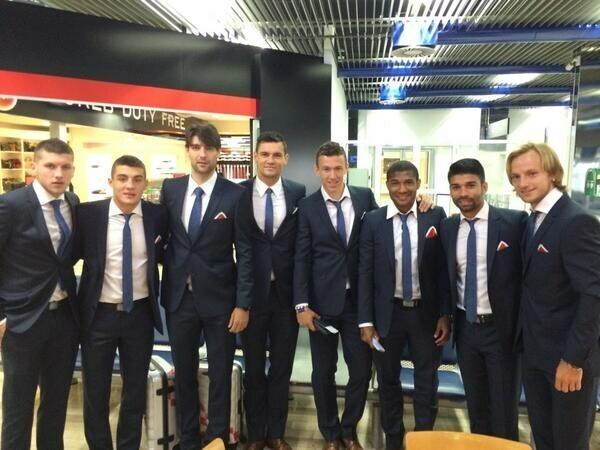 But here is a fully clothed team pic. In other news, while at camp, my daughter couldn’t pull down her pants fast enough and proceeded to squat over a toilet and pee, pants still on. If it makes you feel better, she did wipe her pants. Of course. Proceed as normal. Mexico v Cameroon – meh. Mexico wins. Spain v Netherlands – basically a rematch of last World Cup when Spain won the title. Let’s just say, we might not be watching the same Spanish team from 4 years ago. Netherlands for the win. Chile v Australia – I don’t know if this commercial did anything to boost their national pride, but Chile for the win. 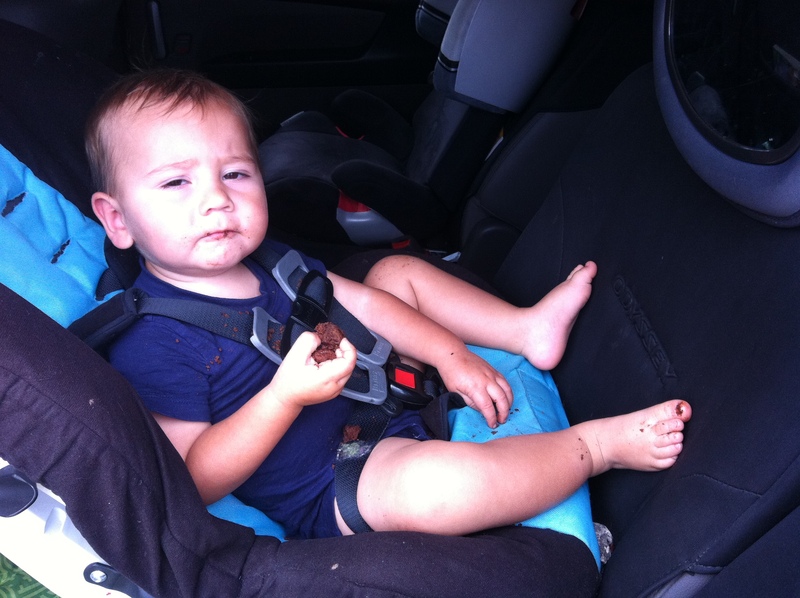 In a complete and total lapse in judgement, I let my son have a cookie in the car. This happened. He has chocolate on his big toe. Why is that even part of a cookie eating equation? 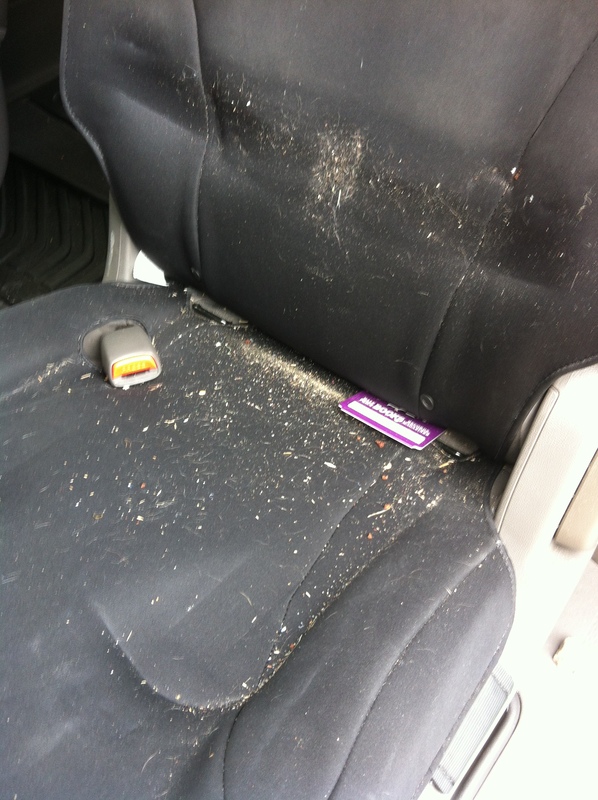 This, of course, means the car seat had to come out. Which meant this happened. I swear. It was just one cookie. I know it’s disgusting, but just keeping it real folks. Our outdoor team kicked off our summer season. When asked where our daughter was I mentioned she was at a Girl Scout twilight camp. Thanks to Stephanie Meyers that word will always seem more about vampires and werewolves and less about the time of day also known as twilight hours. Our team did not get the win, but that doesn’t mean we weren’t the better team. We are always the better team. Colombia v Greece – Colombia for the win. Costa Rica v Uruguay – CR for the win. So far, this is the upset win of the World Cup. 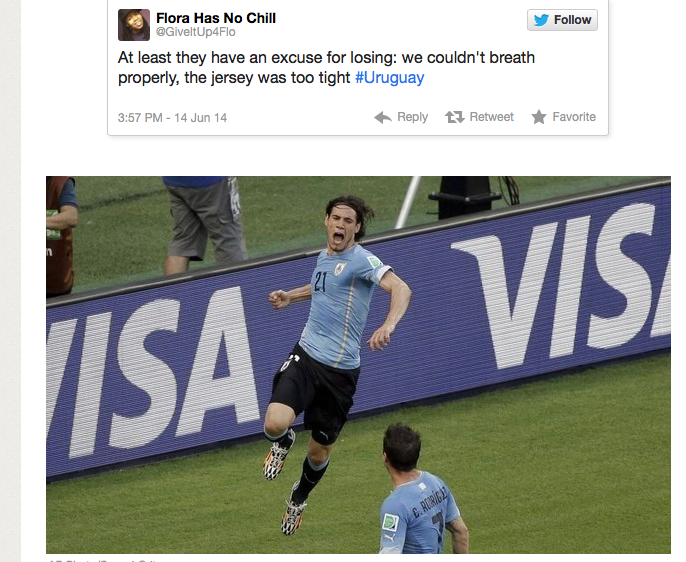 Most people think Uruguay lost because their uniforms were too tight. Stranger things have happened. England v Italy – Italy won. Whatevs. Beckham isn’t playing so I can’t be bothered to care. 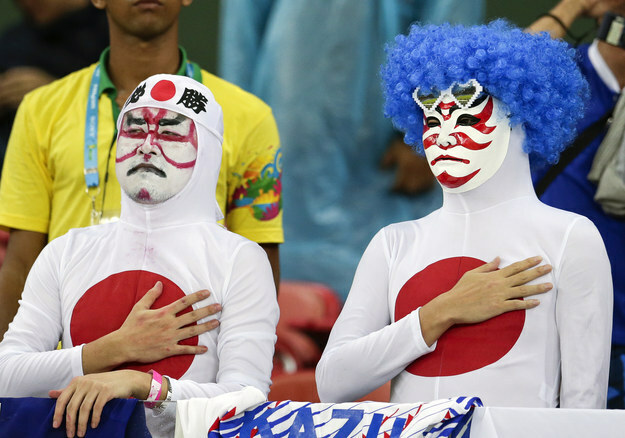 Japan v Ivory Coast – Ivory Coast may have won, but Japanese fans clearly know how show up for a game. Let’s talk about how to pack as much as you can into one day. I helped out at church while my daughter had an indoor soccer game. We then went over to a neighbor’s house for brunch. Following that, we watched our neighbor’s daughter play volleyball. A quick rest and then on to a soccer watching party that ultimately ended with a late night dance party. And while I am all for the music moving my 6-year-old girl into a cross between Crunk and the Elaine dance, I draw the line at dancing on the floor. I’m starting to think it may have been a mistake showing her dance scenes from the Step Up movies. Switzerland v Ecuador – I’m pretty sure I read somewhere that Switzerland was no good. So imagine the shock when they scored in stoppage time/“overtime”. You know what that means, people? ANYTHING. CAN. HAPPEN. ANYTHING. France v Honduras – Oh, France. I never seen a greater display of Blue Steel pre game. If you saw them walk out, you know what I mean. I swear the keeper has been practicing his look for months. Argentina v Bosnia – Messi, Messi, Messi. I feel like Charlie Brown listening to his teacher. Blah, Blah, Blah. To be sure, Messi is good, but this game was a bit slow. Or maybe we were tired from the dance party last night. In honor of tomorrow’s U.S game, I posted this pic today. Holy Cow, U.S. Soccer responded to my tweet. OMGee!!! 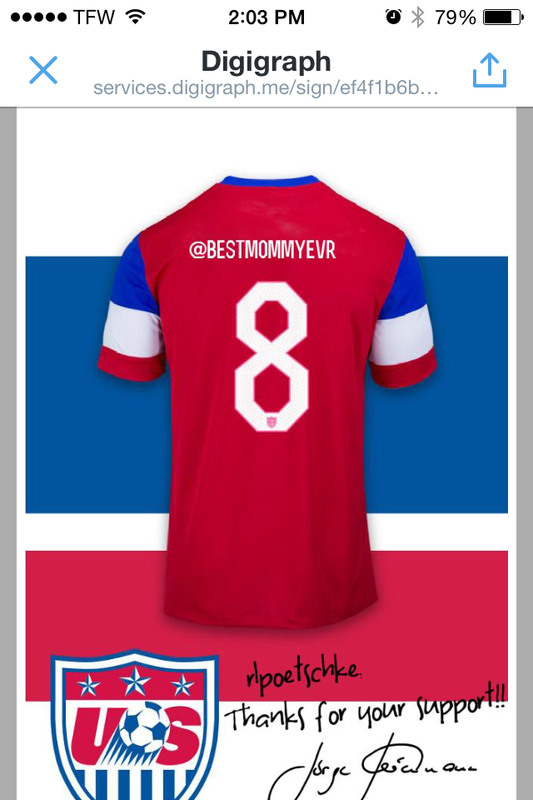 I’m pretty sure they want me to buy the jersey, but OMGEE. When a neighbor offered to take our daughter to a water park today, Lola asked if she should walk to their house. I think she’s over it already. 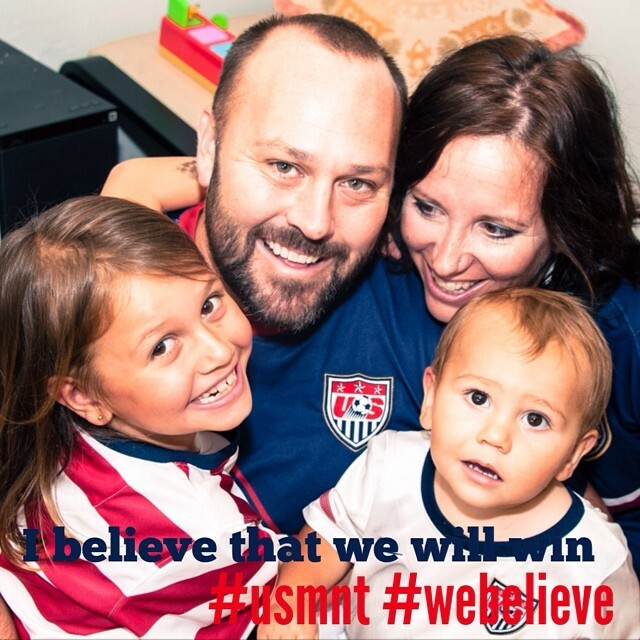 This entry was posted in Because it's funny, Just because, My Favorite Things, Today's Obsession and tagged I believe that we will win, Twilight, US Soccer, USMNT, World Cup 2014. Bookmark the permalink.